Note Additional Anywhere365 Web Agent License required. Anywhere365 Web Agent turns your CRMCRM stands for Customer Relationship Management and is a method/technology for managing contacts of customers. CRM helps to offer each customer an individual value proposition based on its wishes. In addition, CRM makes it visible which customers represent higher value for the organization and therefore might be served in a different way. Application (Microsoft Dynamics 365 or SalesForce) into a powerful tool for contact center agents. Nested inside the interface, the Web Agent provides users with cloud-based omni-channel contact center functionality without having to move between applications. Agents can receive and send calls, chats, emails and video all from within their CRM application. Customer information for inbound and outbound interactions are automatically displayed and directly linked to their CRM record. The Anywhere365 Timeline shows the entire customer journey from initial contact to closing, including interactions transferred outside the contact center, and logs the information in CRM. Agents enjoy efficiency gains and provide greater customer service through an immediate and complete view of the caller’s information in a single pane of glass. Anywhere365 Web Agent runs in the Azure cloud and can utilize the Dynamics 365 Channel Integration Framework (CIF) to integrate with the Microsoft Dynamics Unified Interface or the SalesForce CTI to integrate with the SalesForce Interface. This provides the CRM client with the ability to integrate with rich Anywhere365 contact center and dialogue management capabilities for agents and supervisors. 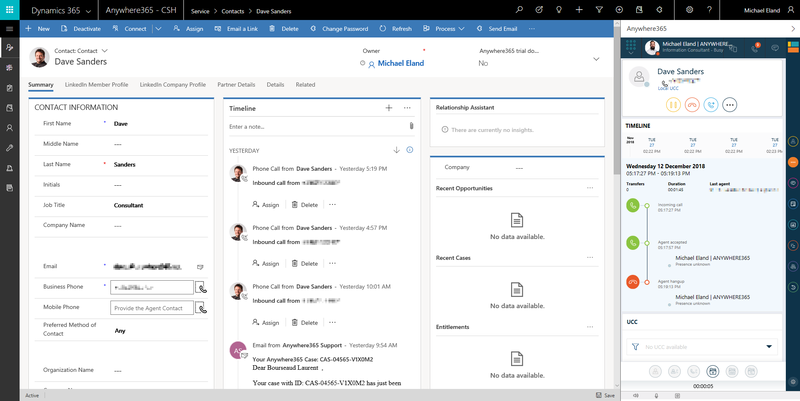 Anywhere365 Web Agent supports Dynamics 365 online, SalesForce, on-premises for Skype for BusinessSkype for Business (formerly Microsoft Office Communicator and Microsoft Lync) is an instant-messaging client used by Anywhere365. In order to use SFB, a Microsoft Skype for Business Server is required. Skype for Business is enterprise software; compared to Skype, it has different features that target businesses., Office365 (Cloud PBX), Microsoft Teams and WebRTC voice.